Project 870: Eugene S. Gaffney,Peter A. Meylan,Roger C. Wood,Elwyn Simons,Diogenes De Almeida Campos. 2011. Evolution of the Side-Necked Turtles: the Family Podocnemididae. Bulletin of the American Museum of Natural History. 350:1-237. The family Podocnemididae consists of 20 genera and 30 species considered here as valid and diagnosable by cranial characters. Three of these genera and eight species persist into the Recent fauna, barely reflecting the evolutionary diversity and distribution of the group. The family extends from the Late Cretaceous to the Recent and occurs in North and South America, Europe, Asia, and Africa. A phylogenetic analysis utilizes 31 podocnemidid taxa (30 named and one unnamed; a total of 37 taxa analyzed includes outgroups) in the Podocnemididae that are analyzed using PAUP. The resulting consensus of nine equally parsimonious cladograms is the basis for a new classification of the family. The family Podocnemididae is reconfirmed as monophyletic, using the unique possession of a cavum pterygoidei formed by the basisphenoid, pterygoid, prootic, and quadrate, underlain by the pterygoid and basisphenoid, among other characters. Much of our resolution agrees with that of França and Langer (2006), which can be modified and restated as follows: (Bauruemys (vilavilensis (Podocnemis (Peltocephalus, Erymnochelys)))). The two clades proposed by Broin (1991) and Lapparent de Broin (2000b, 2001, 2003a, 2003b), designated by her as the “subfamily Podocnemidinae” and the “subfamily Erymnochelinae,” are inconsistent with our analysis. In our analysis the “Podocnemidinae” (sensu Broin, 1991) is paraphyletic, and the “Erymnochelinae” (sensu Broin, 1991) could be made monophyletic, with the important addition of Peltocephalus (placed in the “Podocnemidinae” by Broin). We add a number of new taxa to the basal Podocnemididae and to the broad-jawed subtribe Stereogenyina. Within the family Podocnemididae Cope, 1868, the sister taxon to all other podocnemidids and recognized as the subfamily Bauruemydinae, new, is Bauruemys elegans (Suárez, 1969a), known from associated skulls and shells. All other podocnemidids, the redefined subfamily Podocnemidinae Cope, 1868, are united by a slight to absent temporal emargination, a completely closed foramen jugulare posterius, and saddle-shaped cervical centra (modified as a separate state in Erymnochelys). A basal group of Cretaceous-Paleocene podocnemidids that are the sister group to all remaining podocnemidids, here termed the infrafamily Peiropemydodda, consisting of two taxa from the late Cretaceous of Brazil, Peiropemys mezzalirai, n. gen. et sp., and Pricemys caiera, n. gen. et sp., and Lapparentemys vilavilensis (Broin, 1971), n. gen., from the Paleocene of Bolivia. The resolution of the basal members of the family is: (Bauruemys (Pricemys (Lapparentemys, Peiropemys)) (Infrafamily Podocnemidodda)). The remaining podocnemidids form the infrafamily Podocnemidodda Cope, 1868, new rank, and is characterized by the possession of a cheek emargination that does not reach above the level of the orbit, the medial expansion of the triturating surfaces with a median maxillary ridge present, and the presence of accessory ridges on the triturating surfaces. This group contains the living podocnemidids and a series of extinct forms, including the marine broad-jawed taxa. Within the Podocnemidodda, the genus Podocnemis is the sister group to all the remaining taxa, which is the magnatribe Erymnochelydand. When only the living fauna is considered our results show Podocnemis as the sister taxon to Erymnochelys plus Peltocephalus, in common with Williams (1954c), França and Langer (2006), Meylan et al. (2009), and Cadena et al. (2010). With the fossil taxa present, the Erymnochelydand is united only by the small to absent cheek emargination. However, some of the fossil taxa (i.e., Caninemys, Dacquemys), are not known for a number of characters, and, if the analysis is reduced to include only the living species, Erymnochelys and Peltocephalus are united by a greater number of characters: cavum pterygoidei with enlarged anterior opening, so that the foramen cavernosum enters the roof of the cavum pterygoidei, orbits facing anterolaterally, jugal-quadrate contact present, cheek emargination slight to absent, horizontal occipital shelf absent, premaxillae reach apertura narium interna (also in some Podocnemis), supraoccipital roof exposure slight or absent, chorda tympani enclosed in processus retroarticularis, neural series extends to costal six, and axillary musk duct not in bridge. When one considers just the Recent genera, none of the published molecular results reproduce the Gaffney and Meylan (1988) and Lapparent de Broin (2000b) resolution of (Erymnochelys (Podocnemis, Peltocephalus)); rather these publications show a preference for the (Peltocephalus (Podocnemis, Erymnochelys)) arrangement, while we, in agreement with França and Langer (2006) and the earlier version of the present data set, Meylan et al. (2009), place our marbles with the third alternative, (Podocnemis (Peltocephalus, Erymnochelys)). This latter hypothesis has a number of characters favoring its resolution, even when fossils are excluded. One of the more compelling ones is the large cavum pterygoidei with an enlarged anterior opening and the foramen cavernosum containing the lateral head vein, entering the roof of the cavum pterygoidei. Within the magnatribe Erymnochelydand are the following taxa: Caninemys, Dacquemys, unnamed genus UCMP 42008, Albertwoodemys, Turkanemys, Peltocephalus, Erymnochelys, Neochelys, Papoulemys, and the members of the tribe Stereogenyini (see below). The resolution of Caninemys within the Erymnochelydand is not strongly supported; in only one step it becomes a multichotomy with Podocnemis and the infrafamily Peiropemydodda. Neochelys, Papoulemys (possibly a synonym of Neochelys), and Dacquemys, however, are strongly supported as part of the magnatribe Erymnochelydand, as proposed earlier (Broin, 1991; Lapparent de Broin, 2000b, 2001, 2003a, 2003b). A new shell-based taxon, Albertwoodemys testudinum, n. gen. et sp., and an unnamed skull and shell, UCMP 42008, are united by a high-domed shell with thick lateral ridges along the plastron and the absence/fusion of the pectoral scales. The skull of UCMP 42008 agrees with that in Dacquemys in having large parietals and a supraoccipital covering the posterior margin. Lacking a skull, Albertwoodemys is not entered into the data set, but the skull-shell specimen of the closely related UCMP 42008 is in the analysis. New skull material identifiable as Neochelys has been discovered associated with shells of “Podocnemis” fajumensis Andrews, 1903, resulting in the new combination Neochelys fajumensis (Andrews, 1903). Neochelys has the Erymnochelydand synapomorphy of a large cavum pterygoidei with an enlarged anterior opening and the foramen cavernosum entering the roof of the cavum pterygoidei, as in Peltocephalus and Erymnochelys. The European Neochelys species are Eocene and the African Fayum species is Early Oligocene, extending both spatial and temporal ranges of the genus. The tribe Stereogenyini has a dorsal process of the palatine that reaches the frontal in the septum orbitotemporale, the fossa precolumellaris is absent, and both foramina nervi hypoglossi are combined and recessed in a short canal that opens on the occipital surface. Within the tribe Stereogenyini, Mogharemys blanckenhorni Dacqué (1912), n. gen., is the sister taxon to the well-defined subtribe Stereogenyina. Two groups are recognized within the subtribe Stereogenyina. The infratribe Bairdemydita contains Bairdemys Gaffney and Wood, Latentemys plowdeni, n. gen. et sp., Cordichelys antiqua (Andrews, 1903), n. gen. The infratribe Stereogenyita contains Brontochelys gaffneyi (Wood, 1970), n. gen., Lemurchelys diasphax, n. gen. et sp., Shweboemys Swinton, 1939, and Stereogenys Andrews, 1901. The subtribe Stereogenyina is strongly supported by a secondary palate with a median cleft, unique among turtles, as well as other characters. While the other Podocnemididae were apparently freshwater species, there is evidence that many or all of the subtribe Stereogenyina were marine or near-shore marine. Compared with a group such as the Bothremydidae, we see in the evolution of the Podocnemididae, a relatively conservative series of South American paraphyletic taxa with an unusually persistent cranial as well as shell morphology, beginning in the Late Cretaceous with Bauruemys, Peiropemys, and Pricemys, and continuing with the Paleocene Lapparentemys, culminating in the Recent Podocnemis. A monophyletic Tertiary group with more geographic, taxonomic, and morphologic diversity, the magnatribe Erymnochelydand, contains African, European, Asian, and South American taxa, as well as a radiation of marine, broad-jawed species in the mid-Tertiary. 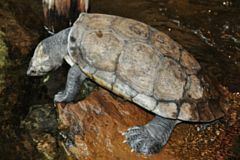 The living remnants of the Erymnochelydand are the South American Peltocephalus and the African Erymnochelys, close relatives despite their current geographic separation.